When stars reach the end of their lifespan, many undergo gravitational collapse and explode into a supernova, In some cases, they collapse to become black holes and release a tremendous amount of energy in a short amount of time. These are what is known as gamma-ray bursts (GRBs), and they are one of the most powerful events in the known Universe. Recently, an international team of astronomers was able to capture an image of a newly-discovered triple star system surrounded by a “pinwheel” of dust. This system, nicknamed “Apep”, is located roughly 8,000 light years from Earth and destined to become a long-duration GRB. In addition, it is the first of its kind to be discovered in our galaxy. Did a Gamma Ray Burst Accompany LIGO’s Gravity Wave Detection? Last week’s announcement that Gravitational Waves (GW) have been detected for the first time—as a result of the merger of two black holes—is huge news. But now a Gamma Ray Burst (GRB) originating from the same place, and that arrived at Earth 0.4 seconds after the GW, is making news. Isolated black holes aren’t supposed to create GRB’s; they need to be near a large amount of matter to do that. NASA’s Fermi telescope detected the GRB, coming from the same point as the GW, a mere 0.4 seconds after the waves arrived. Though we can’t be absolutely certain that the two phenomena are from the same black hole merger, the Fermi team calculates the odds of that being a coincidence at only 0.0022%. That’s a pretty solid correlation. So what’s going on here? To back up a little, let’s look at what we thought was happening when LIGO detected gravitational waves. Our understanding was that the two black holes orbited each other for a long time. As they did so, their massive gravity would have cleared the area around them of matter. By they time they finished circling each other and merged, they would have been isolated in space. But now that a GRB has been detected, we need some way to account for it. We need more matter to be present. According to Abraham Loeb, of Harvard University, the missing piece of this puzzle is a massive star—itself the result of a binary star system combining into one—a few hundred times larger than the Sun, that spawned two black holes. A star this size would form a black hole when it exhausted its fuel and collapsed. But why would there be two black holes? Again, according to Loeb, if the star was rotating at a high enough rate—just below its break up frequency—the star could actually form two collapsing cores in a dumbbell configuration, and hence two black holes. But now these two black holes would not be isolated in space, they would actually be inside a massive star. Or what was left of one. The remnants of the massive star is the missing matter. When the black holes joined together, an outflow would be generated, which would produce the GRB. Or else the GRB came “from a jet originating out of the accretion disk of residual debris around the BH remnant,” according to Loeb’s paper. So why the 0.4 s delay? This is the time it took the GRB to cross the star, relative to the gravitational waves. But was the GRB really weak? Or was it even real? The European Space Agency has their own gamma ray detecting spacecraft, called Integral. Integral was not able to confirm the GRB signal, and according to this paper, the gamma ray signal was not real after all. We know black holes are dangerous to people and galactic objects alike due to their immense gravity. But it turns out the galaxies that host supermassive black holes also have stormy interiors, at least according to one new study. Scientists have found gamma-ray euptions emerging from the center of the IC 310 radio galaxy in Perseus — the strongest such variations in brightness ever found, they say — which they are comparing to a lightning storm. It’s common for changes in brightness to happen in these galaxies as falling matter plunges into the black hole. The radio galaxies also produce jets that shoot matter away from the center at close to the speed of light. Artist rendering of a supermassive black hole. Credit: NASA / JPL-Caltech. What baffles researchers for IC 310 is how quickly they saw brightness shifts– on the order of five minutes, which is odd considering that the black hole’s event horizon (the point where there’s no way you’ll get out of there) requires 25 minutes to go across. This means the lightning is likely coming from a region that is smaller than the event horizon itself. “We believe that in the black hole’s polar regions there are huge electric fields, which are able to accelerate fundamental particles at relativist speeds,” stated study leader Eduardo Ros, a researcher from the Max Planck Institute for Radio Astronomy and the Universitat de València. Results of the study were published in the journal Science. Observatories participating included the Major Atmospheric Gamma-ray Imaging Cherenkov Telescopes (MAGIC) at La Palma in the Canary Islands, and the European Very Large Baseline Interferometer Network. Gamma-ray bursts (GRBs) represent the most powerful explosions in the cosmos, sending out as much energy in a matter of seconds as our Sun will give off during its entire 10-billion-year lifespan. These powerful explosions are thought to be triggered when dying stars collapse into jet-spewing black holes. Yet no one has ever witnessed a GRB directly. Instead astronomers are left to study their fading light. But some GRBs mysteriously seem to have no afterglow. Now, observations from the Atacama Large Millimeter/submillimeter Array (ALMA) are shedding light on these so-called dark bursts. One possible explanation is that dark bursts explode so far away their visible light is extinguished due to the expansion of the Universe. Another possible explanation is that dark bursts explode in galaxies with unusually thick amounts of interstellar dust, which absorb a burst’s light. Neither explanation, however, seems likely as astronomers anticipate that GRB progenitors — massive stars — are found in active star-forming regions surrounded by large amounts of molecular gas. But unfortunately there has never been an observational result to back up this theory either. So astronomers have been working hard to better understand GRBs by studying their host galaxies. Now, a Japanese team of astronomers led by Bunyo Hatsukade from the National Astronomical Observatory in Japan, has used ALMA to report the first-ever map of molecular gas and dust in two galaxies that were previously rocked by GRBs. Hatsukade and colleagues detected the radio emission from molecular gas and dust in two dark host galaxies — GRB 020819B and GRB 051022 — at about 4.3 billion and 6.9 billion light-years away, respectively. The telescope’s high sensitivity enabled the team of astronomers to detect the emission from molecular gas, as opposed to most telescopes, which can only probe absorption along the line of sight. This combined with its high spatial resolution provided the first detailed map of the molecular gas and dust throughout a GRB host galaxy. Surprisingly, less gas was observed than expected, and correspondingly much more dust. The ratio of dust to molecular gas at the GRB site is 10 times higher than in normal environments. The research team thinks the high proportion of dust compared to molecular gas is likely due to the intense ultraviolet radiation from the young, massive stars, which will break up any molecular gas while leaving the dust relatively undisturbed. It’s becoming clear that dust absorbs the afterglow radiation, causing these dark gamma-ray bursts. The team plans to carry out further observations and is excited to use ALMA’s incredible sensitivity to probe other host galaxies. The results are published today in the journal Nature. You can read more from the National Radio Astronomy Observatory and ESO. Following the late night news yesterday of a possible gamma ray burst in our next door neighboring galaxy Andromeda, it was an “Oh darn!” moment this morning to find out the big event was likely a false alarm. The false alert — and the ensuing false excitement — was due to an unlikely combination of Swift’s Burst Alert Telescope (BAT) detecting what was a previously known object and a power outage at Goddard Space Flight Center and Swift Data Center, so that the data couldn’t be analyzed by the regular team of astronomers around the world. Also, according to a blog post by Phil Evans, a post-doctoral research assistant from the University of Leicester and a member of the support team for Swift, the Swift team never actually announced a claim of such an event, and it turns out that the tentative data that triggered this story was overstated. Definitely read Evans’ entire analysis of the event. We have re-analysed the prompt XRT data on Swift trigger 600114 (GCN Circ. 16332), taking advantage of the event data. Update (5/28/14 9:20 am EDT): This alert may have been a false alarm. Further analysis showed the initial brightness was overestimated by a factor of 300. An official circular from the Swift-XRT team says “therefore do not believe this source to be in outburst. Instead, it was a serendipitous constant source in the field of view of a BAT subthreshold trigger.” Please read our subsequent article here that provides further information and analysis. 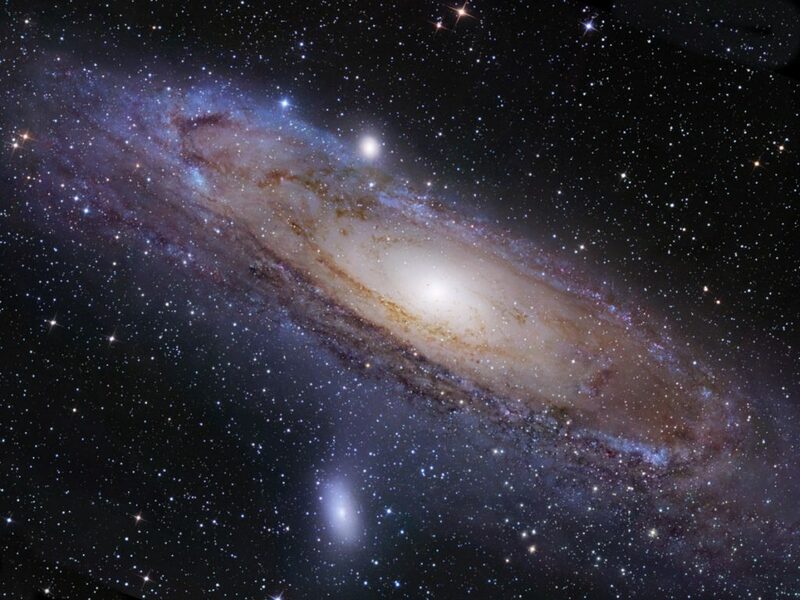 Something went boom in the Andromeda Galaxy, our next door neighbor. The Swift Gamma-Ray Burst telescope detected a sudden bright emission of gamma rays. Astronomers aren’t sure yet if it was a Gamma-Ray Burst (GRB) or an Ultraluminous X-Ray (ULX) or even an outburst from a low-mass x-ray binary (LMXB), but whatever it turns out to be, it will be the closest event of this kind that we’ve ever observed. One of the previous closest GRBs was 2.6 billion light-years away, while Andromeda is a mere 2.5 million light years away from Earth. Even though this would be the closest burst to Earth, there is no danger of our planet getting fried by gamma rays. According to astronomer (Bad Astronomer!) Phil Plait, a GRB would have to be less than 8,000 light years away cause any problems for us. This event is providing astronomers with a rare opportunity to gain information vital to understanding powerful cosmic explosions like this. If it is a GRB, it likely came from a collision of neutron stars. If it is a ULX, the blast came from a black hole consuming gas. If the outburst was from a LMXB, a black hole or neutron star annihilated its companion star. Astronomers should be able to determine the pedigree of this blast within 24-48 hours by watching the way the light fades from the burst. The Swift Burst Alert telescope watches the sky for gamma-ray bursts and, within seconds of detecting a burst Swift relays the location of the burst to ground stations, allowing both ground-based and space-based telescopes around the world the opportunity to observe the burst’s afterglow. As soon as it can, Swift will swiftly shift itself to observe the burst with its X-ray and ultraviolet telescopes. The burst alert came at 21:21 pm Universal time on May 27, 2014; three minutes later, the X-ray telescope aboard Swift was observing a bright X-ray glow. News of the event quickly spread across the astronomical community and on Twitter, sending astronomers scrambling for their telescopes. According to astronomer Katie Mack on Twitter, if this is indeed a GRB, this gamma-ray burst looks like a short GRB. No two GRBs are the same, but they are usually classified as either long or short depending on the burst’s duration. Long bursts are more common and last for between 2 seconds and several minutes; short bursts last less than 2 seconds, meaning the action can all be over in just milliseconds. As we noted earlier, more should be known about this blast within a day or so and we’ll keep you posted. In the meantime, you can follow the hashtag #GRBM31 on Twitter to see the latest. Katie Mack or Robert Rutledge (Astronomer’s Telegram) have been tweeting pertinent info about the burst.